Have you ever wanted to quit your job after working for years? Have you ever wondered what it really means to stick to your job for years? In today’s article we are going to tell you about having a lot of work experience and why you should continue doing that job where you already are from 10 years. 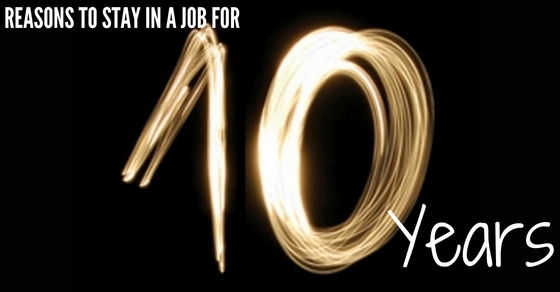 If you stay in your job for 10 years or more, you will be able to land the job of your dreams. Experts have stated that staying for a longer period of time will help you get the job you have always imagined. The present position that you serve will help you gain more experience and get what you want eventually. Unless you know where exactly you would like to go, it is almost impossible to find out how you can get there. Another reason to stay in your job for 10 years is that it will pay for your expenditures. The current job you have could be a short term goal but to be precise, it is helping you in several ways. The good thing about working anywhere is that all your bills shall be taken care of. Imagine a life without a job. Would you be able to manage? Of course not! Plus if you are working for years, the benefit is entirely yours. When you have been working at your office for a very long, it gives you more opportunities to expand and explore. You get to speak to others, communicate with others etc. You also get to hang out with people from the other industry. Plus it is a much better option than just staying at home and applying for work and not even getting one of them. If you stay in one office for long, you open doors for yourself for bigger and even more opportunities. Another great reason for you to stay inside a job for ten years is that it will help you get a lot more better reference. There are chances that will require you to provide some professional references for those spots that you have been applying for. You should be extremely careful and try to keep away from any downtrodden people in such cases. One of the best things about having a job for about ten years is that you can immediately boost your chances of being promoted. When you have worked in a company just for two years or so, you will surely not be able to make any money or anything. Neither will you have chances of being promoted. So if you actually stick to one job, you can make more money, get a raise and actually be promoted. Doesn’t it sound great? When you have been in a job for maybe like a year or two, people will see you like a normal person who is making a normal living. But if you have been working for years, that too maybe for more than ten years; then obviously your impression is going to be different. People are going to see you differently and have more respect for you than they have for others. So if you’re planning to quit that job, maybe you should think twice. Whether it’s a meeting at work or an important discussion that needs to be made, you are definitely going to be called for all important occasions at work. After all, you have been a part of your workplace for years and have a good idea of what happens and what the rules are. You could actually have a very important say in places and situations such as these. Working at an office for a long period of time will give your day some kind of structure that something else cannot. When your life has no motive and no structure, there is a big chance it will lead to relationship problems or depression. Of course it would be a wonderful idea if you get to sleep for a couple of days but there is no better way to have better structure in life than going to work regularly. Work is something that gives you some sense of self esteem. If you have been working for a long period of time, all the better! Most people want to find a certain identity when it comes to getting a job and why not? That is what makes you who you are. Getting your own identity and maintaining that too could be a huge challenge when you are not even working. It is very hard to present all your strengths and skills. You have to present them the right way when you don’t have the self esteem. Another plus point of having a job in ten years is that it will help you indentify what you like and what you don’t. It helps you explore different aspects of a job and see which position you enjoy best and which ones you can do without. You have to keep a notebook in hand and focus on what you are hoping to find in your next position. In that way, you will be able to recognize it easily whenever you see it. If you weren’t aware, there are several other important benefits you can make use of. Whether it is educational reimbursements or new opportunities to meet different people, attend more workshops and conferences, this is what you will get. Why wouldn’t you want to reap all these amazing benefits if you’ve been working for a while? People who hop from one job to other will have to pay a high price as they won’t get a big retirement account at all. Every change in your job will require a move so that you get a high transaction cost for changing homes which we believe is not very ideal. So if you really want a good fund once you have retired, we would definitely recommend you to stick to the current job that you have and just go for it. If you have enjoyed reading this article and have some feedback for us, do let us know in the comment box below. Also if you have queries or more questions in mind, you can let us know more about it. We would love to hear about it from you. On that note, good luck and make sure to stick to that job. You never know what you could be missing out on! Next articleHow to Include Volunteer Work on Your Resume?